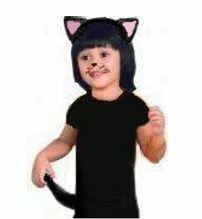 Send your child out to pounce for candy and goodies this Halloween with this cute homemade costume! 1. Draw cat ears on the cardboard. Cut out the ears and cover with black construction paper. Add smaller pink triangles to decorate, as shown. 2. Glue ears to the plastic headband. 3. Make a tail out of a stuffed long sock and safety pin it to the seat of the pants. Optional: draw cat whiskers on your child's face and black makeup for their nose.